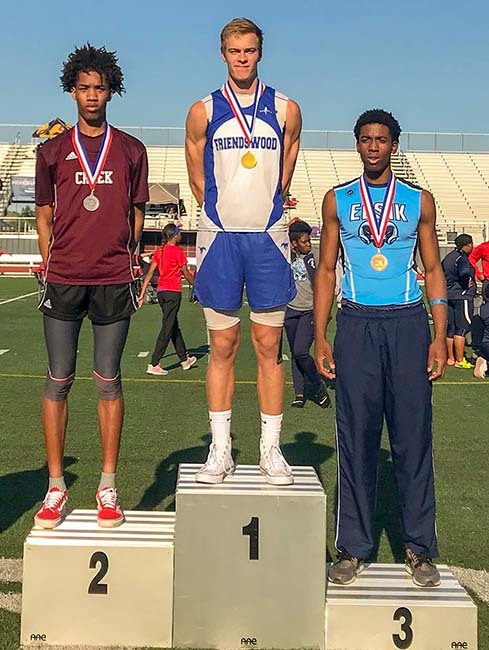 AREA CHAMPION - Friendswood junior Mike Hermes (center) received his gold medal for winning the 6A Region III area high jump with a winning height of 6-6. Hermes is joined on the medal stand with Clear Creek's Donta Smith (Silver - 6-4) and Alief Elsik's (Bronze - 6-4). Hermes qualified for the state track meet last year as a sophomore. PEARLAND — The Class 6A Region III area track meet featured schools from District 23-6A and District 24-6A with the top four places in each event advancing to the 6A regionals next week in Humble. The regional meet will determine who qualifies for the 6A state track meet at the Michael A. Myers Stadium on the University of Texas campus in Austin. The Dawson Eagles won the area meet with 105 points with the Pearland Oilers claiming second place with 67 points. The third place team was Alief Taylor (62) followed by Clear Springs (56), Alief Hastings (48), Clear Falls (38), Dickinson (37), George Ranch (35.5), Brazoswood (35), Alief Elsik (35), Friendswood (34), Clear Lake (26), Clear Creek (23.5), Clear Brook (14), and Alvin (4). Those qualifying for the regional meet included several outstanding tracksters hoping to advance to the state track meet. Pearland's Alphonso Tyler qualified in two events as he won the 3200 meters (9:42.49) and placed second in the 1600 meters (4:27.09). Friendswood's McGregor Garrett placed second in the 3200 meters (9:47.66) while Dawson's Kyle Stacks placed third (9:48.53). Stacks won the 1600 meters in another classic battle with Tyler as Stacks edged Tyler 4:27.075 to 4:27.094 at the tape with both advancing to regionals. Garrett also qualified with a time of 4:36.18. The Dawson quartet of Marco Jackson, Myles Kitt-Denton, Bobby Wooden, and Jacolby Shelton won the 4x100 relay in 41.05 while the Pearland foursome of Jaelin Benefield, Cheo Mwandani, Malcolm Linton, and Julian Jaime placed fourth (42.24). Friendswood's Brandon Lantau placed second in the 800 meters (1:57.81) while Dawson's Jonathan Cedillo placed third (1:58.53). Dawson's Jacolby Shelton won the 100 meters (10.44) and placed second in the 200 meters (21.22). The Pearland 4x200 relay team of Rashaad Hammond, Cheo Mwandani, Jaelin Benefield, and Julian Jaime placed fourth with a time of 1:28.26. Dawson's Frederick Lewis placed third in the 400 meters (47.95). The Dawson quartet of Marco Jackson, Frederick Lewis, Caleb Eaton, and Jonathan Cedillo captured first place in 3:16.34. Dawson's Michael Bogues won the discus with a throw of 156-5 while Pearland's Jaret Porterfield placed fourth at 145-2. Pearland's Trace Johnson placed third in the triple jump with a leap of 45-2.5 while teammate Caleb Malbrough placed fourth at 44-9.5. Friendswood's Mike Hermes won the high jump at 6-6 while Pearland's Rashaad Hammond placed fourth at 6-0. Pearland's Cole Burgess placed second in the pole vault with a height of 15-0 while Friendswood's Brandon Dela Fuente placed fourth at 13-6. All of the above tracksters will be competing at the 6A Region III meet with aspirations of qualifying for the state track meet on May 11-12 in Austin.